Today I invited Heidi Zielinski to share her experience with traveling a lovely group exhibit. I learned a few things from what she wrote and perhaps you might too. Here is what she has to say.. I submitted a comment to Lyric’s blog recently and she has asked me if I would expand on it and be a guest blogger, so here it is. Thanks for the invite, Lyric! I belong to a small informal group of fiber artists called Montana Bricolage Artists (MBA) and we live in the Missoula and Bitterroot Valley area of western Montana. In 2011 we were inspired to create “The ‘Trunk’ Show”, our first exhibition. The pieces hang suspended from the ceiling and are long and narrow like trees and include many techniques and styles—each as unique as the 13 artists who created them. Because of the way they hang viewers are able to move through the “trees” as if it were a forest creating a unique interactive experience. The theme and interactive nature attract a diverse audience to this exhibit. An MBA member arranged for us to exhibit in a Missoula art gallery for two months. The exhibit was well attended and we had two sales, both of which pleased the gallery owner—always a good thing! The next venue was a local annual three day fiber art show, An Affair of the HeART, in Hamilton, Montana in February of 2012. Two of the “Trunk” artists are organizers for this show. As unofficial “curator” of “The ‘Trunk’ Show”, I reviewed submission requirements on the internet for potential venues in Montana and sent information and images to a number of them. I also contacted the Pacific West Quilt Show and they accepted it as a special exhibit. 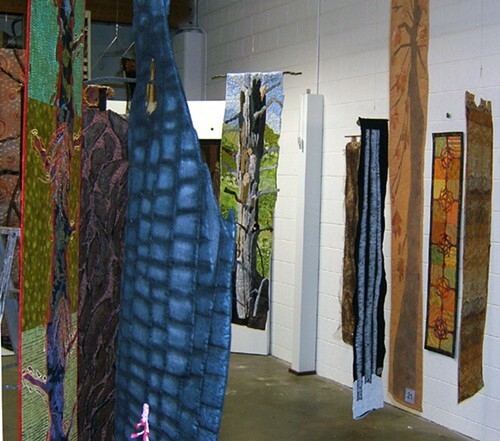 MBA members transported and hung the “Trunks” at that show in Tacoma, Washington in 2012. We had a response from the Hockaday Museum of Art in Kalispell, Montana who said they couldn’t accommodate the unique hanging space required for this show, but would have interest in considering future shows from us. As a result of the submission mailing, the Missoula Art Museum (MAM) proposed to us that they present our exhibit to the Montana Art Gallery Directors Association (MAGDA), a group of galleries and art museums across Montana and into North Dakota. These groups would have the opportunity to book our show and as our sponsor, MAM would create a shipping crate, signage, and handle the logistics of getting the show to the venues. 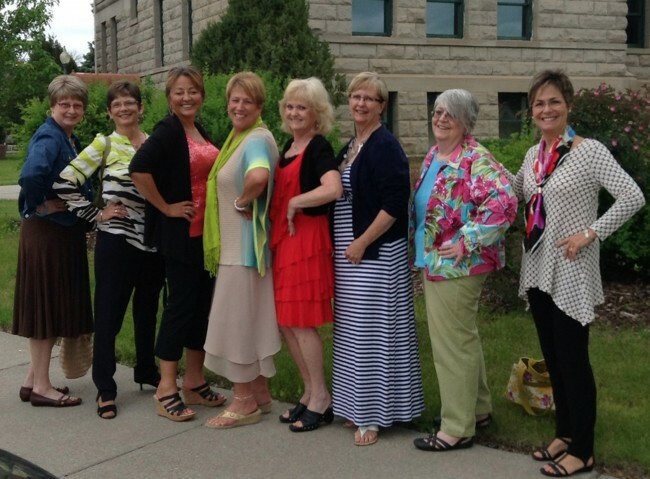 We were booked for 2 six week stints by The Paris-Gibson Square Museum of Art in Great Falls, Montana and the Holter Museum of Art in Helena, Montana. The museums requested additional work for the walls so a piece from each artist was added and the show hung in Great Falls last summer and goes to the Holter Museum later this spring (2014). The Paris-Gibson had strong local interest and a diverse audience for the show including groups of children who particularly enjoyed the interactive experience. One of the Trunks sold at this venue as well. Last year we were contacted by the Provo Utah Library who had found our show on the internet and were interested in it for their large new gallery space. They booked it for November/December of 2014 and will pay all shipping costs and MAM is going to allow us to use the crate they created and help us ship it to Provo. This may be the last venue for our “Trunks”, but who knows?!! The artists originally committed to two years for this show but have welcomed the opportunities that have arisen to share their art with the public. I believe that the professional way we have interacted with the venues, the quality of the art, and the interactive quality has helped to make this a successful exhibition. We are establishing a reputation which we hope will help us find venues for our next exhibition! I live in Great Falls, Mt. and I saw this exhibit in person when it came to Paris Gibson Museum. This museum is a wonderful place for artist of all types. They also do not charge an entry free, it is paid for by a Great Falls company. I everyone to put it on your list if you happen to be coming to the Great Falls area. It was the article in Fabric Trends magazine (Spring 2010) about the “Fabric Forest” shown in Houston that inspired “The ‘Trunk’ Show”—particularly the way they were suspended. Our group set very general parameters to allow artists to make the pieces in their own style and have freedom in their approach. No two forests are the same although trees do seem to give everyone the same desire to stroll among them, look up at them, and admire them. 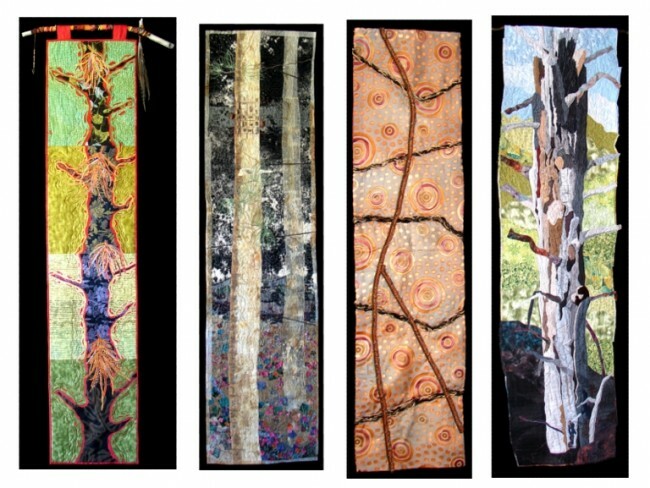 Thank you to Irene Kahmann, German quilter, who walked through the woods and was inspired to create a unique quilt display that reflected that experience, and thus inspired us. I also wanted to mention the artists not pictured: Mickey Frissell, Brooke Atherton, Joyce Brown, Diane Bierwagen, and Heidi Zielinski. The trunk show is very similar to our quilt forest. Have you seen the forest from the Groebenzeller quiltgroup 2009 at the International Quilt Festival in Houston? The idea for the quilts had Irene Kahmann, she wrote a book about the trees (Der Stoff aus dem die Baeume sind). 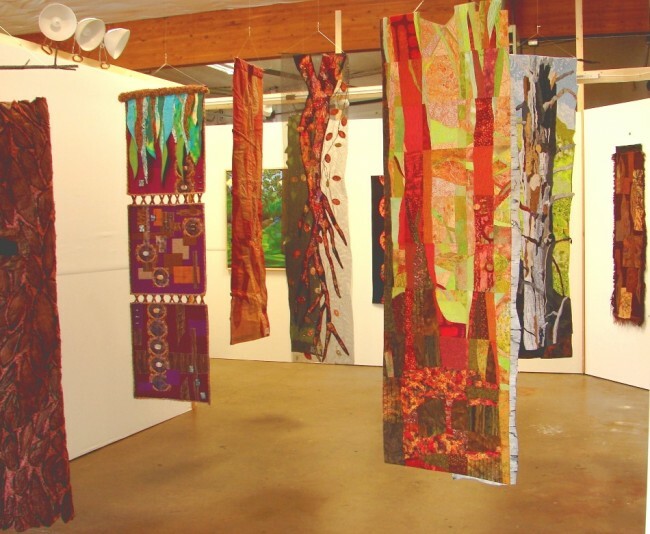 Our quilts are long and thin and show the bark of trees. The bark is on both sides and the quilts hang free from the ceiling. 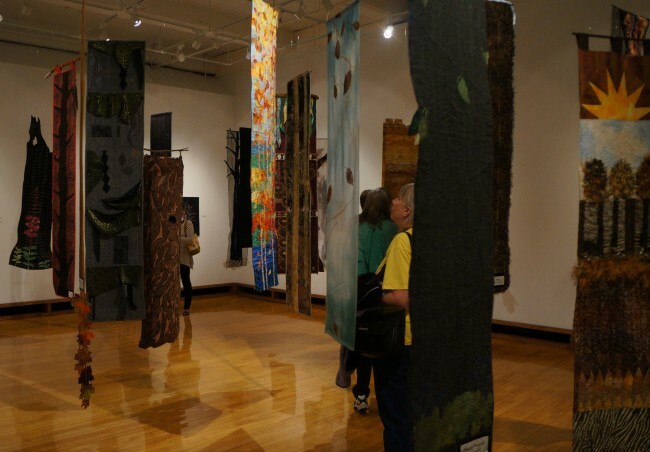 You could walk between the quilts like a walk in a forest. This exhibtion was first shown in 2008 in Groebenzell, a little town near Munich. I don´t know how to add pictures to this message. But, if you tell me, you can clearly see that the trunk show has the same idea. Thanks for this story Heidi. Sometimes it is just about being in the right place at the right time. But sometimes it is about having something unique and giving people a chance to think they might ‘need’ it.